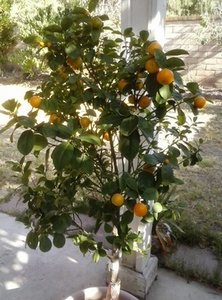 In Eastern traditions, the kumquat tree is considered a symbol of prosperity and good luck. It is one of the Lunar New Year's most popular festive trees. In miniature form, kumquat could be cultivated as bonsai. Although the fruits can be eaten raw, they are typically served as jam or candied fruits. Some people believe eating kumquat would aid nasal congestion and relieve coughing. 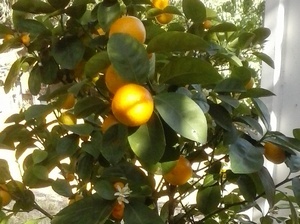 Depending on the size, a full-grown kumquat could yield hundreds of fruits per year. The one in my garden produces about 80 to 100 fruits a year.